"..... thousands and thousands of Seagulls," Sullivan said shaking his head. "The only answer I can see, Jonathan, is that you are pretty well a one in a million bird. Most of us came along ever so slowly. We went from one world into another that was almost like it, forgetting right away where we had come from, not caring where we are headed only living for the moment. We choose our next world through what we do and learn from this one". Sullivan stretched his wings and turned to face the wind. "But you Jonathan", he said, "learned so much so quickly, that you did not have to go through a thousand lives to reach this one". From Jonathan Livingstone. Seagull by Richard Bach. "The rising star of Sri Lanka politics"
It was October 1987 and the conversation was between two journalists attending a dinner given by the Foreign Correspondents Club of Bangkok (FCCB) at the Dusit Thani Hotel. Gamini was the Chief Guest and had been invited by the FCCB to address them on the "Emerging Scenario of South Asian Politics". The American correspondent of a leading daily was further questioning the Indonesian journalist Ms. Yuli Ismatono. "Soft spoken, articulate, and a thinker", replied Ms. Ismatono. I have already met him in Colombo, a month ago, and interviewed him for my newspaper". He will mesmerize you with his brilliance" she added. The dining hall was packed to capacity  Media people of all shades and colours, both physical and of political leanings were there. Dr. Sarath Amunugama, Mrs. Srima Dissanayake and Gamini were seated at the head table along with the distinguished array of senior journalists from "Time magazine, "Wall Street Journal" etc. After dinner Gamini got up to speak. In my minds eye, I can still picture him in a light grey silk national dress, elegant, debonair and beaming with self confidence. He spoke for almost an hour on subjects ranging from Indias influence in South Asia, both political and economics, urban terrorism, to the thrust towards the 21st century and how the poor countries of South Asia can and must get together. There was pin drop silence. Gamini was at his seductive best. The standing ovation that followed his conclusion was remarkable. The applause seemed never ending and the President of the FCCB had to actually appeal to the audience to stop, if he was to allow questions related to the then recently concluded Indo-Lanka Accord, which unsurprisingly he defended with conviction and vigour. The next morning his telephone message counter was flooded with requests for personal interviews. It was too much to handle, but he did manage to speak to representatives of the "Washington Post? ", the "Bangkok Post" and I think the: "South China Morning Post." Gamini Dissanayake had the talent inherent gift of being able to address his mind to a variety of subjects in a given 24 hours  I have watched him talk with intense interest and knowledge to a delegation of Buddhist monks at his residence, then drive down to the Sri Lanka Foundation Institute and deliver a well thought out address on the subject of Irrigation and Water Management areas, come back to Colombo in the afternoon, address businessmen at a Chamber meeting, and end the day with the after dinner speech to a cricketing audience. I asked him how he manages this and he said" is easy you have to discipline your mind to compartmentalize your thought process"  I have forgotten that advice. It is not so easy for someone who had associated so closely with Gamini for about 25 years to write an appreciation of him without appearing to the reader to be subjective, indeed, it is difficult. However in this article, I am only endeavouring to portray some human interest elements of his life which I know best, and which historians will overlook. July 1983 was a watershed in the socio-ethnic and political history of our country. Gamini was then living at Simon Hewawithane Mawatha off Duplication Road. During that black week, several people saw him standing on top of his lane and organizing relief operations of food parcels and provisions to be distributed to the Tamil refugees. What the country did not see or know was that he had hidden away three Tamil families in his own house, including the domestics of one of them. On the Friday following the Sunday night riots, I visited him very early in the morning. I had been hearing, over the previous few days, many people saying that Gamini was harbouring Mr. Chandrahasan in his house. Many of his friends were upset, asking why Chandrahasan of all people? Besides, rumours were floating in the Colombo drawing room circles about Tamil refugees in Gaminis house. Tamil friends as refugees was one thing but, as far as some Sinhala chauvinists were concerned, keeping Chandrahasan was intolerable. With this in mind, I walked in and found him having a very early breakfast in order to fly up to Nuwara Eliya later on in the morning. Having breakfast with him I brought up the subjects of Tamil refugees and Chadrahasan. He flew into a rage with me and said "Ruz, you are talking like a communalist", so what if I am having Tamil refugees" Chandrahasan is not here with me, but he is my friend and if he seeks my help, Ill keep him here too, so what?" I felt pretty ashamed of myself and explained that I had not come there to pass judgement on what he was doing but to caution him that many Scintilla people were turning against him and to be careful that mobs do not attack his house too. He just waved his hand and said "Ruz, in life one has to take a stand, say what has to be said. Do what has to be done and then face the consequences." Just as I was about to leave, he received a call from the Presidential Secretariat asking him to be ready to attend an emergency cabinet meeting. He called his secretary and asked him to cancel his scheduled visit to Nuwara Eliya. That very Friday afternoon arson and looting broke out in the Nuwara Eliya town. Gamini was shattered, heart broken and dismayed. During that same week a mob was gathering to loot and torch the residence of the late S. J. V. Chelvanayagam down Duplication Road. Gamini on hearing the news rushed to the spot, defied the mob with the help of his bodyguards, got them to withdraw. "If Chelvanayagams house is torched", said Gamini "a valuable collection of books from his library would have been destroyed", ironically, Gamini himself was accused of a role in the burning of the Jaffna library. To those of us who knew him and his character, it was unthinkable and unacceptable. But such was the manipulative and marketing powers of his political detractors. His rapid political ascendancy was a combination of many factors. It has been said that for a politician there is no better education and maturity in the rough and tumble of politics than a period of experience in the Opposition. Gamini retrospect was fortunate in that he entered Parliament from the opposition at such a young age in 1970. At a time when his party seemed annihilated and the swing in the country was against it he was one of only seventeen to be elected. With his legal background and articulate thinking. He soon became the cynosure of the eyes of both Parliamentarians and the country. The 1972 by-election which he contested and won gave him national prominence. The fact that he had to lock horns in the Chamber with the political giants of the time like N. M. Colvin, Felix Dias and the like catapulted him into futures focus. The subsequent elections of 1977, where his party won and he entered Cabinet, as its youngest member, is a matter of contemporary history. Gamini could never be faulted with indecisiveness, inefficiency or procrastination. He had the ability to grasp and get to the core of issues in double quick time. Once he decided it was "all systems go". He never allowed himself to get bogged down by Nitty gritty. He gave a free hand to his officials. He had the gift of attracting talented people who gravitated towards him because of his ability to inspire, motivate, give them a direction, a clear political vision, and then stand by them. All those who came in contact with him both on official or personal levels knew where they stood with him. He was not one to hide his emotions or feelings-when he was happy he laughed and laughed loud. When he was sad he wept and cried even in public and when he got angry ... everybody scattered !! He was never ashamed to express his emotions. When he was not chosen as the Prime Minister by the Premadasa administration, he locked himself upstairs, at his official residence at Bullers Road and refused to meet anyone for a short period. When I asked him why he did that, he said "Because I am human and my emotions would not permit me to see people with a broad smile on my face whilst disappointment pervades within. When I am happy the world must know my happiness. When I am sad I cannot be deceptive". The period 1989 to 1994 saw a new Gamini Dissanayake emerging as it were from the political debris caused by disappointment, eviction from Cabinet, scars of impeachment, loss of a comrade in Lalith, and the rise and decline of the DUNF. But then his star changed with the proverbial impermanency in politics. 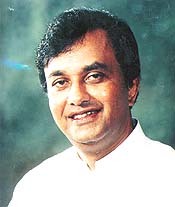 In mid 1994 when he entered Parliament as a UNP Member, the new maturity in Gamini was amply evident. When he won his seat at the last elections, with an unprecedented mandate, from the Central Province, of almost two hundred thousand votes, I visited him at Dangolla to congratulate him, he looked at me mischievously and very philosophically said "Wise men learn more from defeat than from victory, thank you all the same". Ever the student, Gamini had a probing mind and an intellectual curiosity which constantly compelled him to seek new ideas, cut new-ground and carve out new paths in his political journey. He took advantage of the numerous people who visited him. Talking to technical people about their aspects the Mahaweli Project, with consultants on the macro aspects of it, with businessmen and financiers about commerce and economics, with farmers about their perspectives  but all the time picking their minds and learning from them. He would then put all the inputs into good use when he addressed seminars or International forums. His sense of advocacy together with his commitment to his vision were such that he could paddle any dream to any body and soon make the other person feel it is also his dream and his mission. A case in point is the manner in which he got about his cricket administration. No sooner did the country obtain Test Status, he got to work diligently and systematically in creating a new structure and a cricket culture. Within months, he invited and gathered round him one afternoon, at the Mahaweli Ministry, the captains of trade industries. Over tea and sandwiches he articulated the need for infusion of capital to keep the game alive. He talked of a national effort to uplift the game, the creation of a Foundation - promised tax benefits to those who contribute and topped it up with a film on Cricket. The audience was sold, the concept accepted. The visitors left the building in an hour pledging a vast sum of money. To keep the momentum going he got down Sir Garfield Sobers to be the Guest of Honour at the dinner to launch the Foundation. He got President Jayawardena to come to add glitter to the occasion along with Sir Gary Sobers. The whole country was mobilized in a Cricket crazy frenzy. An indoor nets, for practice was set up. In order to make it a total human development process, he befriended and got down Dr. Rudi Webster (Barbados Ambassador to the USA) and a colleague of Sir Gray to inculcate sports psychology to our cricketers. Cricket in Sri Lanka was never going to be the same. Gamini had opened vistas. In 1989 when he was appointed the Minister of Plantation Industries, he wasted no time in gathering around him people who could give him the best counsel. He studied his subject and mobilized the best talents in the field of Plantation Management, promotion of tea through the Tea Board and getting new concepts in to place. The "Cluster System" as a new programme for management was to have far reaching changes. Suffice would be to quote from an article written by Mr. Sepala Illangakoon, who Gamini admired and respected and got him associated with him in his ministry. "And then suddenly, after four decades of monotony and with no heralding, the Messiah of the plantations appeared  Gamini Dissanayake" (From "Vision of Plantations" Sepala Illangakoon). From the Swarnaboomi programme to the Samodaya Foundation, from Cricket to Plantations, to LJEW Union work to Mahaweli, Gamini immersed himself with commitment and a sense of urgency which permeated down to all those who worked with him. He was always "The young man in a hurry". The work he had done in all the above fields will always remain a tribute and a legacy to his untiring efforts. In the years and decades to follow there is no debate about Gaminis place in history. His personal friends will remember him for his forgiving character, compassion, great sense of mischief and humour. His fans in the field of Cricket will remember him through the Cricket Foundation and the envisaged Gamini Dissanayake Cricket Academy. The farmer and the peasant who were beneficiaries of the Swarnaboomi title deeds and the Mahaweli Project will always hold him dear to their hearts. The many officials who worked for him hold him in admiration for the direction and sense of purpose he gave them. A few days ago the Gamini Dissanayake Foundation launched its first project. The Gamini Dissanayake Institute of Technology and Vocational Studies in Kandy. Over the next few years the many students who will pass out from his institute in the field of computer literacy and enhanced knowledge of English will perpetuate his name with grateful thanks. His place in the hearts and minds of those who came into contact with him is best described by the words of the poet Khalil Gibran.